When these two sides met at the New Bucks Head in April the spectre of National League North relegation hung over both clubs . The hosts won 3-2 on that occasion and both sides were eventually spared the drop with something in hand. Fast forward to August and those self same relegation-haunted clubs were flying high in the National League play-off spots ahead of this Bank Holiday Monday clash. Their rises up the table had come on the back of the goalscoring exploits of their strikers, with a number of scouts at the Phillips 66 Community Stadium to see if Dan Udoh and Matty Stenson could maintain their prolific form. As it was, it was Stenson who was first to catch with another coolly taken penalty, opening the scoring in the seventh minute. However, it was not enough to put Brakes on the road to three points, with Adam Dawson levelling with a sweetly struck free-kick before Andre Brown headed the visitors in front just after half-time. Jamie Hood stabbed home from close range to level and Telford were denied a repeat of that April scoreline when Brown’s penalty, just two minutes later, was pushed away by Tony Breeden in the home goal. Brakes boss Paul Holleran made one change from the side that picked up a 2-0 win at FC United 48 hours earlier, James Bowen coming in for the injured Connor Gudger. The visitors included Udoh, signed in the summer following a loan spell at Brakes but were without Stephan Morley who picked up a knock in their win over Chester on Saturday. A scrappy opening had already been punctuated by far too many refereeing interventions before Thomas Parsons pointed to the spot in the sixth minute after half-hearted home appeals for a handball. Stenson was not about to turn down the gift and sent Max Bromley the wrong way for his sixth goal of the campaign. Callum Gittings’ threat from distance was again underlined when he connected superbly with a first-time strike from 25 yards, with Bromley doing well to smother it. Brown worked space for a shot which was deflected for a corner as the visitors looked for a response and was then bravely in to get his head to a left-wing cross, needing treatment after clashing with James Mace who also picked up a knock. A real up and under clearance from Hood created an anxious moment for Bromley who had to backpedal to gather the ball as it swirled in the blustery conditions. Despite plenty of endeavour from both sides there was little in the way of goalscoring action but temperatures were raised when Joe Clarke and Udoh challenged for a ball on half-way. Clarke came off worse but when he rose from his treatment it was he who received the caution. The subsequent free-kick allowed Telford to play the ball into a dangerous area and another foul, this time a little more clearcut, presented Dawson with a shooting chance on the edge of the D.
The strike beat the wall and although Breeden got a hand to it, he was only able to help it into the net. Brakes’ bench were screaming for a penalty when Stenson was manhandled in the box, Jack Edwards latching on to the loose ball and firing over the bar from a decent position. Edwards then sent in a threatening cross which was superbly shepherded behind by Ryan Sears under pressure at the far post. 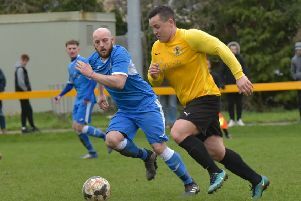 The visitors raced back to the changing rooms at the half-time whistle and were quickly out of the blocks in the second half, taking the lead just three minutes in. Jonathan Royle showed neat footwork to evade the challenge of Edwards and, afforded space to pick out a cross, delivered the perfect ball for Brown to head inside the post to make it 2-1. Stenson’s willingness to chase a lost cause almost fashioned an equaliser just past the hour mark for Brakes, the striker robbing a defender and sending in a cross-shot which Kieran Dunbar was just inches away from converting. Just a minute later, however, Brakes were back on terms. A scramble in the box had already seen Hood somehow miscue when presented with an open goal but when the ball rebounded straight back to him he made no mistake, stabbing home from close range. Telford came straight back at the home side and when Brown tumbled under pressure from two defenders, referee Parsons was quick to point to the spot. Brown took the responsibility but Breeden guessed right and parried the ball away, with a follow up shot deflected for a corner. A first-time strike from Dunbar was deflected on to the post, while Brown grazed the angle with an over-the-shoulder volley as both teams sensed the three points were there for the taking. As it was it was the visitors who were presented with the final opportunity to complete a maximum haul from their bank holiday weekend. However, with the goal gaping and Brakes expecting an offside flag, Royle could only spoon Darryl Knights’ cross high over the bar.